In the wake of tragedy, like the Pulse nightclub attack in Orlando, Fla., where 49 people died and 53 were injured in a mass shooting, many people are moved to action. And we saw it happen. People raced to donate much-needed blood for those injured. Landmarks were lighted in rainbow colors. But it can seem overwhelming for an individual to process how he or she can help in such a situation. While it may seem small, purchasing a T-shirt that honors those lost is another powerful action—and statement. In this industry, we know the power of a T-shirt. We know how many impressions they provide—and how effective those impressions can be. A shirt donning a slogan in support of Orlando combats the hate that caused this tragedy and unites us all in support of our fellow man. When you combine the power of the message with the fact that the proceeds (or at least a portion of them) from these shirts go directly to organizations that help causes related to the tragedy, it becomes a tangible method of assistance. And there are plenty of ways to get involved—whether that’s through buying one of the many shirts already out there or creating one of your own. 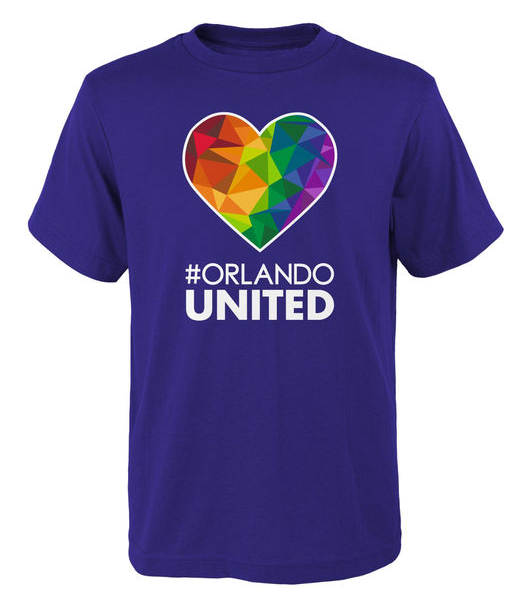 All of Orlando’s professional sports teams—the Magic, Lions, Pride, Predators and Solar Bears—are selling “#OrlandoUnited” T-shirts. All proceeds go to the OneOrlando Fund, which was created to provide support to the victims of the Pulse tragedy and their families. The nearby Tampa Bay Rays also gave away “We Are Orlando” T-shirts to attendees of their sold-out annual Pride Night game on June 17. Several bands have incorporated the rainbow into their merch, with all proceeds from the shirts going to the Pulse Victims Fund. Panic! At The Disco rereleased a limited edition “Girls Love Girls and Boys” shirt, Beartooth’s Pride shirt is available on their online store, and PVRIS’ limited edition tee sold out within hours. “Hamilton” star and writer Lin-Manuel Miranda released a design for Orlando inspired by his sonnet he recited at the Tony Awards. The shirt, released yesterday, is now sold out, but will return in July with new “Love is Love” collection pieces. A portion of the proceeds goes to Equality Cares. Ellen DeGeneres launched a T-shirt with a simple design, touting love and kindness, which is sold through ED by Ellen. All proceeds go to The National Compassion Fund, which is helping the victims and their families. Barstool Sports, a Massachusetts-based website, is selling a “Together Orlando” T-shirt, tank and ladies’ tee that pays homage to old-school Orlando Magic jerseys alongside the American and LGBT flags. Proceeds go to the victims’ families. While many shirts can be found on Teespring that support the cause and donate to organizations, the company itself designed and is selling a “Love Orlando” tee until July 4, with proceeds going to the LGBT Community Center of Orlando. OMGI Yoga, an apparel company that creates custom yoga wear, has created the “ONELOVE” Yoga Pant, which features 102 hearts—each representing a victim or individual injured during the shooting. All profits will be donated to the National Center for Victims of Crime and the Orlando Health Foundation. PrintFly, a Philadelphia-based custom apparel company, launched a T-shirt fundraising campaign with its “Philly’s Heart Beats with Orlando” tee. Not only will all of the proceeds benefit the Pulse Victim Fund, but the company also will match the funds the shirts raise. Retail company Opening Ceremony launched its “Celebrating Pride 2016” collection, which features the logos of five iconic LGBTQ bars and clubs on tees, sweatshirts, tanks and hats. All of the profits will be donated to the Pulse Victims Fund. There are plenty of other options. (Like this one, and this one, and this one, and this one.) All sorts of organizations and individuals are getting involved and spreading a message of love and support. The healing process won’t be easy, and, sure, a T-shirt alone isn’t the answer to ensuring a tragedy like this never happens again. But together, we can put love before hate, we can honor those lost, and we can help the victims’ families and survivors—one T-shirt at a time. Allison Ebner is content editor for Promo Marketing, NonProfit PRO and Print+Promo. Reference any animated movie, "Harry Potter" character or '80s band and you'll become fast friends.